Why Hasn't Tesla (TSLA) Stock Collapsed? 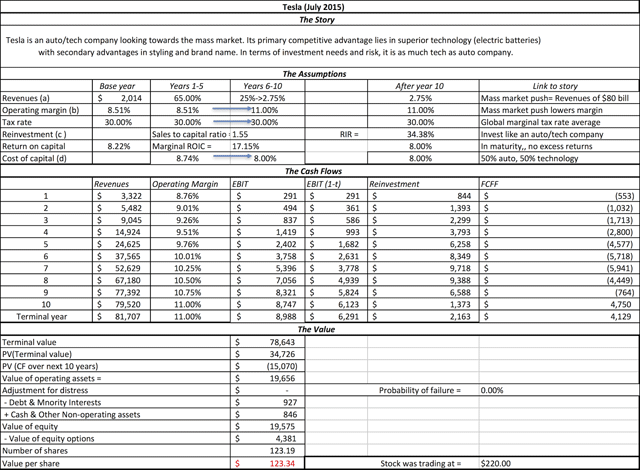 HomeEditors PicksWhy Hasn’t Tesla (TSLA) Stock Collapsed? Why Hasn’t Tesla (TSLA) Stock Collapsed? The last few weeks have tested Tesla’s (TSLA) shareholders and frustrated short sellers in the stock. Shareholders have had to weather a series of bad news stories, ranging from a failure to meet its shipment targets in the last few months to a fatality with a driver using its autopilot function to a surprise acquisition of Solar City (SCTY). While each of those stories has created pressure on the stock, the price has held up surprisingly well, frustrating long-time short sellers who have been waiting for a correction in what they see as an overhyped stock. So, what gives here? Why has Tesla’s stock price not collapsed facing this adversity? I think that Tesla’s price action illustrates the power of the “big story” and the sometimes difficult-to-understand market dynamics of story stocks. In earlier posts, I have made a case for valuation being a bridge between story and numbers, with every number telling a story and every story being captured in a number. 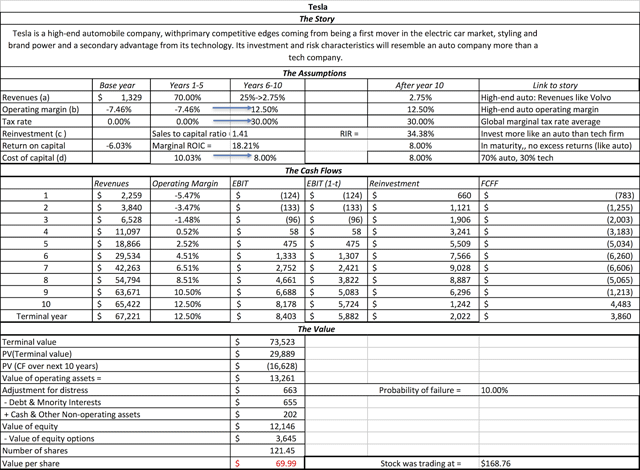 Thus, while your final valuation may be composed of forecasts of revenue growth, profit margins and reinvestment, it is the story that binds together these numbers that represent the soul of the valuation. That said, the balance between stories and numbers can vary across companies and for the same company, can change across time. For most companies, it is the story that comes first, with numbers following, and for others, it is the numbers that tell the story. 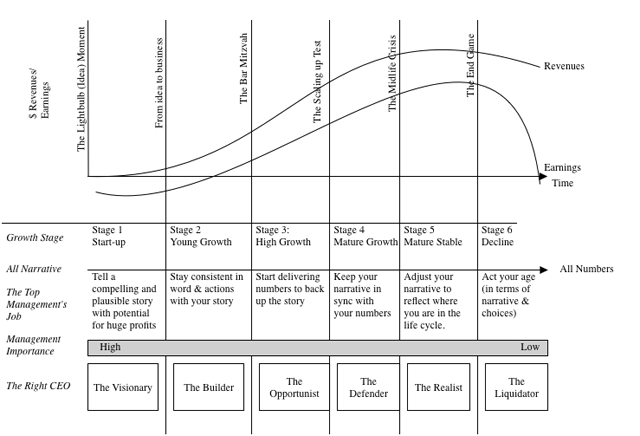 Story changes and information: it is shifts in the story that cause price and value changes. An earnings report that beats expectations (in either direction) or a news story of significance (good or bad) may not have any effect on either (value or price) if it does not change the story. Conversely, a shift in perceptions about the business story, triggered by minor news or even no news at all, can trigger major price changes. Wider disagreements: When a company’s value is driven primarily by numbers, there is less room for disagreement among investors. Thus, when valuing a company in a market with steady revenue growth and sustainable profit margins, there will be less divergence in what investors think the stock is worth. In contrast, with a story stock, investor stories can span a much wider spectrum, leading to a much bigger range in values, as illustrated with Uber in this post. The key to understanding story stocks is deciphering the story behind the company, then checking that story for reasonability and making it your own. 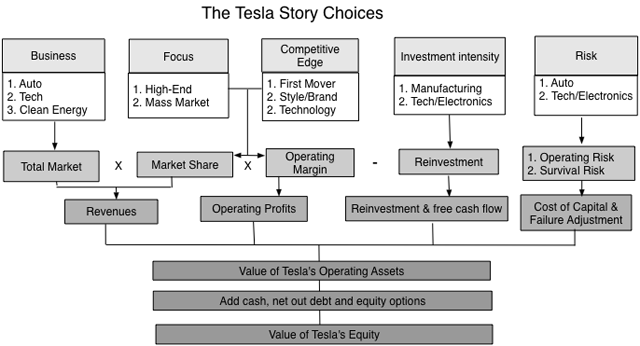 So, what is Tesla’s story? To structure the process, let me lay out the dimensions where investors can differ on the story and how these differences play out valuation. The first is Tesla’s business, i.e., whether you see Tesla primarily as an automobile company that incorporates technology into its cars, a technology company that uses automobiles to deliver superior electronics (battery and software) or even a clean energy company with its focus on electric cars. The second is focus, i.e., whether you believe that Tesla will cater more to the high end of whichever business you see it in or have mass market appeal. The third is the competitive edge that you see it bringing to the market, with the choices ranging from being first to the market, superior styling & brand name and superior (proprietary) technology. The fourth is the investment intensity needed to deliver your expected growth, with much higher reinvestment needed if you consider Tesla a conventional manufacturing company (like autos) than if you see it as a tech company. Finally, there is the risk in the company, with the auto story bringing with it the risks of cyclicality and high fixed costs and the tech story the risks of being rendered obsolete by new technologies and shorter life cycles. The value that you attach to Tesla will be very different if you consider it to be an automobile company, catering to a high-end clientele than if you view it as an electronics company with a superior technology (in electric batteries) and a mass market audience. The value that I obtained for Tesla’s equity was $12.15 billion (with a value per share of $70) well below the market capitalization of $28 billion (and a stock price of $168.76) at the time. 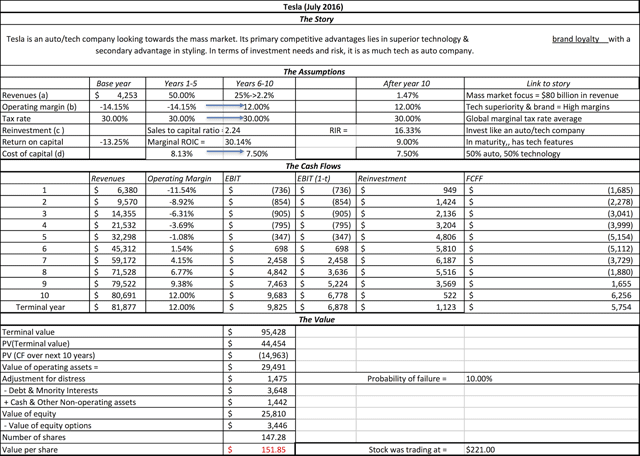 The value of equity based on these inputs was 19.5 billion (share price of $123), much higher than my September 2013 estimate, but still below the value of $33 billion (share price of $220) at the time. Note that there are pathways that lead to the value at or above the current stock price but they all require navigating a narrow path of building up sales, earning healthy profit margins and reinvesting more like a technology company than an automobile company. So, what effect does acquiring Solar City have on the story? If nothing else, it muddies up the waters substantially, a dangerous development for a story stock and that is perhaps even why even long-term Tesla bulls and nonplussed. The most optimistic read is that Tesla is now a clean energy company, with a potentially much larger market, but the catch is that Solar City’s products don’t have the cache that Tesla cars have as well as the competitive nature of the solar power market will push margins down. If you add the debt burden and reinvestment needs that Solar City brings into the equation, Tesla, already stretched in terms of cash flows, may be over extending itself. The most pessimistic read is that talk of synergy notwithstanding, this acquisition is more about Musk using Tesla stockholder money to preserve his legacy and perhaps get back at short sellers in Solar City. The Solar City acquisition spotlighted how difficult it is to separate Tesla, the company, from Elon Musk. Musk’s strengths, and there are many, are at the core of Tesla’s success but his weaknesses may hamstring the company. On the plus side, Musk clearly fits the visionary mode, dreaming big, convincing customers, employees and investor to buy into his dreams and, for the most part, working on making the dreams a reality. Like Bezos at Amazon and Steve Jobs at Apple, Musk had the audacity to challenge the status quo. On the minus side, Musk is less disciplined and focused than Bezos, whose story about Amazon has remained largely unchanged for almost 20 years, even as the company has expanded into new businesses and markets. In fact, as someone who has followed Apple for more than three decades, it seems to me that Musk shares more characteristics with Steve Jobs in his first iteration at Apple (which ended with him being fired) than he does with Steve Jobs in his second stint at the company. Musk is a large social media presence, but he does strike me as thin skinned, as his recent exchange with Fortune magazine about the autopilot fatality showed. Your views on what you think Tesla is worth will be a function of what you think about Elon Musk. If you believe, as some of his most fervent defenders do, that he is that rarest of combinations, a visionary genius who will deliver on this vision, you will find Tesla to be a good buy. At the other extreme, you consider him a modern version of P.T. Barnum, a showman who promises more than he can deliver, you will view Tesla as over valued. Wherever you fall in the Musk continuum, Tesla is approaching a key transition point in its life, a bar mitzvah moment so to speak, where the focus will shift from the story to execution, from master plans to supply chains, and we will find out whether Musk is as good at the latter as he is in the former. Can Musk the visionary become Musk the builder? He certainly has the capacity. After all, if you can get spaceships into outer space and back to earth safely, you should be able to build and deliver a few hundred thousand cars, right? 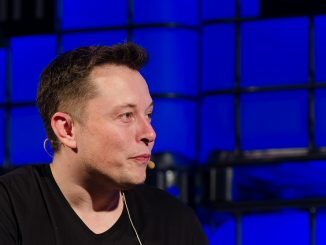 Given Tesla’s missteps on delivery and execution, though, Musk may not have the interest in the nitty gritty of operations, and if he does not, he may need someone who can take care of those details, replicating the role that Tim Cook played at Apple during Steve Job’s last few years at the company. Tesla is a company where there seems to be no middle ground. You are either for the company or against it, believe that it is on a pathway to being the next Apple or that it is worth nothing, a cheerleader or a doomsdayer. I think that both sides of this debate are over reaching. I don’t buy the talk that Tesla is on its way to being the next trillion dollar company, especially since I have a tough time justifying its current valuation of $33 billion. 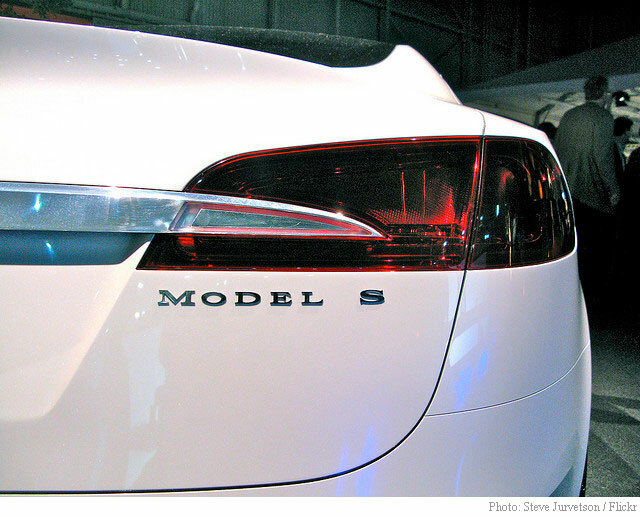 Unlike some of the high-profile short sellers who seem to view Tesla as an over-hyped electric car company that is only a step away from tipping into default, I do believe that Tesla has a connection to its customers (and investors) that other auto companies would kill to possess, brings a technological edge to the game and has viable, albeit narrow, pathways to fair value. I will choose to sit this investment out, letting others who are more nimble than I am or have more conviction than I do to take stronger positions in Tesla. 3 Comments on Why Hasn’t Tesla (TSLA) Stock Collapsed? Any one who view Tesla as a car company can’t value it properly. This type of company happens once in a century. Many people can’t value it correctly because there are no models to follow. This is like valuing Berkshire Hathaway 50 years ago as a textile company, when Warren Buffett was the controlling shareholder. Tesla is clearly on it’s way to become a trillion dollar company. Most people can not comprehend. By the way, after more than one million percent gain, Berkshire is also on it’s way to become a trillion dollar company. Totally agree…people keep trying to put Tesla in a single box, when it’s an expanding vision about an alternative energy source and the way an emerging culture will generate and avail themselves of that energy. Just look at the cars for a moment…not just safer and faster than ever before, but with over the air updates and a developing Autopilot system which will allows drunks to get home safely and elderly people to “drive” well into their advanced years. There is so, so much here…worldwide superchargers that will fully charge in 5-10 mins (within about 2 years per Straubel recently), super inexpensive long-lived batteries via Panasonic andTesla gigafactory and so on. What about Autonomous Semi’s delivering goods faster (24 hour driving) and cheaper? Or how all of this will stimulate our economy when people get new jobs installing solar throughout the country, have more money in their pockets from rooftop solar or “free” gas savings, or cars that no longer wear out in 150,000 miles but go 3x that (yet cost the same). How about poorer people able to purchase a used car which won’t keep breaking down and will last a lifetime, sold only because the seats were getting a little ragged. And so on. There is so much potential here…but analysts are (rather curiously, really) not visionaries.